The "Fortress of the Stone Giants" SoundPack gives you the complete audio solution when playing the "Fortress of the Stone Giants" Adventure. All the preparation is done for you, and every sound you'll need is right at your fingertips. After an assault on Sandpoint, the heroes learn that they were but a scouting party, and that the stone giants are massing for war. The only way to disrupt their advance is to strike at the Jorgenfist, the fortress of Warlord Mokmurian, the sinister giant responsible for gathering his people for war. What secrets wait to be discovered in the dungeons below the Jorgenfist, and what is the true reason the giants have rallied for war? See the individual SoundSet Product descriptions for more details. Are the Pathfinder Adventure Path SoundPacks useful when I'm not running Adventure Paths? 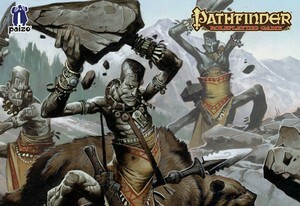 Pathfinder Adventure Path: Rise of the Runelords Anniversary Edition, Fortress of the Stone Giants © 2012. Paizo Inc., the Paizo golem logo, Pathfinder, and Pathfinder Adventure Path are trademarks of Paizo Inc. Author: Wolfgang Baur. SoundSet © 2014. Sounds created under license with Paizo Inc.